Queen of Katwe hits theaters everywhere on September 23 – and I for one cannot wait to see it. I have heard that it is beautiful, touching, and a must see. I plan to go see it opening weekend. To help celebrate the release of Queen of Katwe, a group of bloggers have gotten together to bring you an awesome prize pack. One lucky winner will get a copy of the Queen of Katwe book and a Wooden Chess Set. “Queen of Katwe” is the colorful true story of a young girl selling corn on the streets of rural Uganda whose world rapidly changes when she is introduced to the game of chess, and, as a result of the support she receives from her family and community, is instilled with the confidence and determination she needs to pursue her dream of becoming an international chess champion. Directed by Mira Nair (“Monsoon Wedding”) from a screenplay by William Wheeler(“The Hoax”) based on the book by Tim Crothers, “Queen of Katwe” is produced by Lydia Dean Pilcher (“The Darjeeling Limited”) and John Carls (“Where the Wild Things Are”) with Will Weiske and Troy Buder serving as executive producers. The film stars Golden Globe® nominee David Oyelowo (“Selma”), Oscar® winner and Tony Award® nominee Lupita Nyong’o (“12 Years a Slave”) and newcomer Madina Nalwanga. Enter to win the Queen of Katwe prize pack using the giveaway form below. Be sure to check out my other giveaways while you are here. Prizes subject to change depending on availability. A prize of equal or greater value will be substituted. 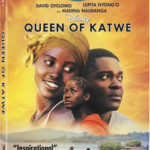 enter your queen of katwe prize pack .